The Lenovo K6 Note doesn't really offer anything special in the display department. The Chinese manufacturer has stuck with a 5.5-inch LCD panel for some time now. It is of the IPS variety and with a resolution of 1080p. That works out to 401 ppi, which is still perfectly sharp. There are two display modes to choose from for the panel. Neither is really what we would consider truly color accurate, but the Normal preset definitely comes closer. The average DeltaE here is 4.8 - not too bad, with the Orange and Yellow being the most inaccurate at 7.2. The Vibrant mode offers a little more "pop" and it is what most users are likely to find more appealing. Interestingly enough, Lenovo has decided to enhance both the greens and the blues, but the red is almost unchanged. The DeltaE in this mode is 5.8 on average and goes as high as 10.4 in Magenta. Contrast levels turned out quite decent for an LCD. With a maximum brightness of 521 nits and almost no noticeable light in the blacks, there is plenty of contrast to go around. While decent, sunlight legibility of the Lenovo K6 Note is nothing to rave about. Plus, the front panel is a bit more reflective than we would have liked and viewing angles could use some improvement as well. 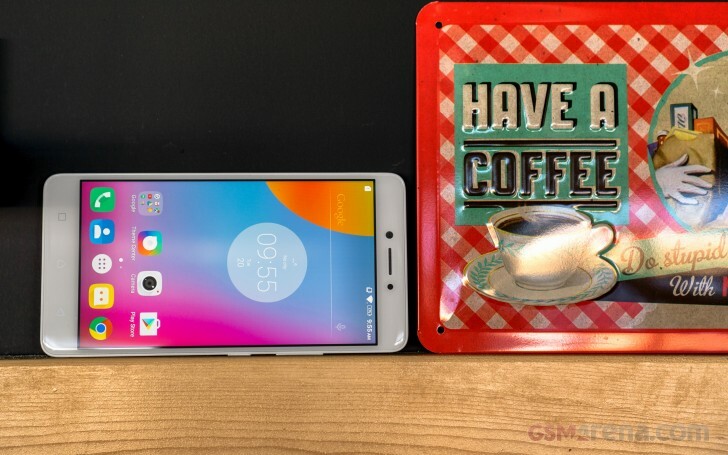 The Lenovo K6 Note is available in a Dual-SIM configuration in certain markets. As already mentioned, the downside is that it uses a hybrid tray, so you have to sacrifice one of the SIM cards to get some extra storage. LTE is also on-board with a speed cap set at Cat.4 or 150 Mbps downstream and 50 Mbps up. Wi-Fi is fairly basic, but we can't really ask for more on a budget device. There is only 2.4 GHz available and b/g/n standards. On the flip side, however, Bluetooth is a modern 4.2. Sadly, NFC is missing, but, as a consolation, there is an FM radio on board. The microUSB 2.0 port supports OTG so that you can hook up flash drives and other USB accessories to it. It cannot output video, as there's no MHL or SlimPort functionality. As previously mentioned, the Lenovo K6 Note offers a tangible battery upgrade over its predecessors. At least on paper, that is. It packs a 4,000 mAh battery, sealed-in under the non-removable metal back. Thanks to that, the Lenovo K6 Note managed a solid 91hours in our proprietary battery endurance test. That is a very respectable result, indeed. The increased battery capacity definitely helps a lot in this respect, but so do various other software optimization, both on Lenovo's end and Android in general. The lack of any form of quick charging on the Lenovo K6 Note is really frustrating, especially nowadays. What is even more annoying, is the fact that the Snapdragon 430 does officially support Qualcomm's Quick Charge 3.0 technology. Perhaps Lenovo has a valid reason for leaving it out, but the end result is a handset that still requires overnight charging. Our review unit managed to draw a maximum of 2A and an average of around 1.6A from the wall. This left it with 15% of extra charge after 30 minutes and 35%, after an hour.